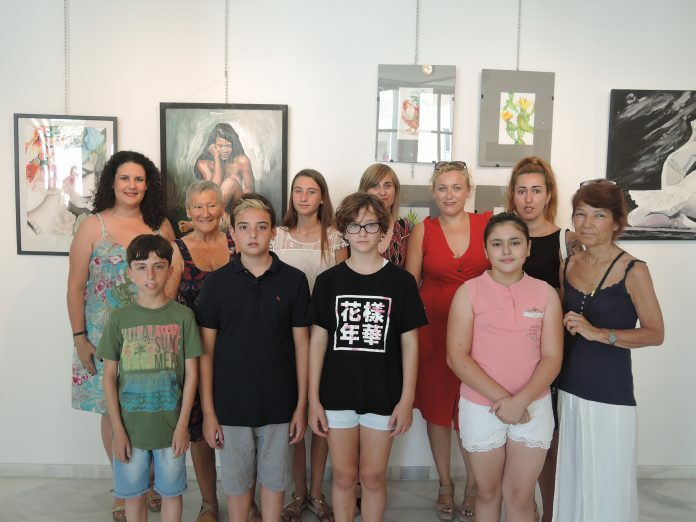 Throughout July, the Association ‘Amigos de la Pintura’ exhibition will be on show at Mojácar´s Municipal art gallery, “La Fuente”. Under the leadership of their teacher Graciana Peralta, 16 of the 30 artists in the group have almost 100 pieces of work on display representing a whole range of artistic techniques such as oil, watercolour, collage, charcoal, etc. in styles from the very traditional to the most avant-garde. Of particular interest is the inclusion of young people to the Association, bringing in new generations to forge their own steps in the art world, learning and experimenting along the way with the most innovative techniques that will form new artistic concepts in the future. With students ranging from 7 to 80 years of age, Graciana Peralta manages to bring together an array of artistic sensibilities in her studio that enriches everyone and, is evident in the work produced. She has seen through her teaching that “many could not believe what they were capable of doing” and that, perseverance and creativity are the secret of success as she encourages everyone to approach painting without fear. Raquel Belmonte, Mojácar´s Culture Councillor was at the opening and had a chance to chat with Graciana and the artists. She expressed how impressed she was by the high quality of the paintings, particularly those by the youngest exhibiting members, some of whom are only 8 and 9 years old. The “La Fuente” Centro de Arte is open to the public, with free admission, from 9.00 a.m. to 1.00 p.m. from Tuesdays to Fridays and from 10.00 a.m. to 13.00 p.m. on Saturdays and Sundays.